I have lost my four upper front teeth and would like to have them replaced with dental implants some day. In the meantime, I don’t want to use the type of partial denture known as a “flipper.” Is there something else I can use, at least temporarily? You could well be in luck. The newer flexible removable partial dentures (RPDs) are being used more and more commonly for temporary, or on occasion permanent, replacement of missing teeth. These dentures are providing a comfortable and successful alternative to traditional RPDs. Flexible RPDs are actually made of a form of nylon first introduced into dentistry in the 1950s. Technically known as super-polyamides, or, in this application, as flexible polyamides, these resins are tough, resistant, extremely durable and strong. The material is thermoplastic, meaning it will change shape under high heat so that it can be injection-molded into flexible denture bases to which replacement teeth are subsequently attached. The flexibility of these dentures provides several advantages over the traditional RPD alternatives made of rigid, acrylic plastic resin. Flexible, nylon-based RPDs can look realistic, stay securely in place and be more comfortable to wear. Instead of metal clasps, they have thin finger-like extensions that fit or snap into natural concavities in the crowns of the teeth near the gum line. The flexible RPD also provides an option for cosmetic improvement of adjacent teeth that appear elongated due to gum recession: The realistic-looking, gum-colored base can be made to cover areas where natural gum tissue has receded (shrunk down) and partially exposed tooth roots so that flexible RPDs provide a smile improvement and offer an instant aesthetic solution. Dentures made of flexible polyamides can also provide an alternative for people who are allergic to acrylic; and they are thin, lightweight and resistant to fracture. However, they are difficult to reline, rebase and repair. And while they have less of a propensity to stain (especially from teas, coffee and wine) than traditional acrylic dentures, they still need to be properly cleaned and maintained. Like other partial dentures, flexible RPDs maintain space — i.e., stop remaining natural teeth from moving into the gaps where teeth are missing. They are used to otherwise restore function and aesthetics during the transition to more long-term and definitive tooth replacements. 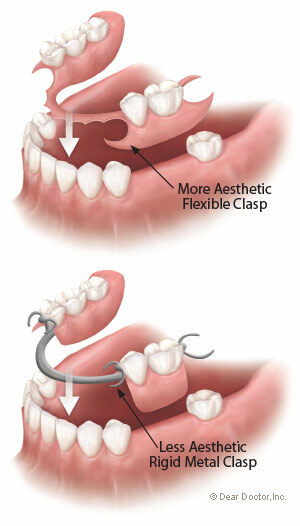 The “flipper” is another type of RPD made of acrylic plastic resin; it is also known as a “temporary” (denture). Flippers tend to be rigid and relatively thick so that they are strong enough to resist breakage. They tend to cling around the necks of the existing teeth, to which they attach with the addition of metal wire clasps to aid in their retention and stability. They tend to be less comfortable, looser fitting, and prone to wear and staining — and can be flipped in and out by the tongue, hence their name. Permanent RPDs are more commonly used for those who are not candidates for dental implants or fixed bridgework, or have financial limitations. They have traditionally been made from a relatively comfortable and unobtrusive thin chromium cobalt metal structure to which plastic acrylic naturally colored teeth and gums are attached. Metallic retentive clasps are often used to help keep the appliances in place, but these can be unsightly in areas near the front of the mouth. All types of RPDs must be removed and cleaned thoroughly, as they tend to allow increased bacterial biofilm accumulation on the teeth at the gum line. As mentioned earlier, flexible RPDs are held in place by little projections that fit into the areas between the teeth and gums. This can trap food and bacteria, and render certain areas inaccessible to the cleansing, antibacterial action of saliva. Therefore it’s very important to remove the dentures periodically to practice regular and optimal oral hygiene, and to clean the appliances. This will help prevent gingivitis (inflammation of the gums) and tooth decay. Also, RPDs should never be worn overnight, when salivary flow is reduced, making the mouth dry and the potential for bacterial buildup worse. We hope this clarifies the alternatives you have on the road to more permanent tooth replacement. Speak to your dentist about what would be best in your particular situation.